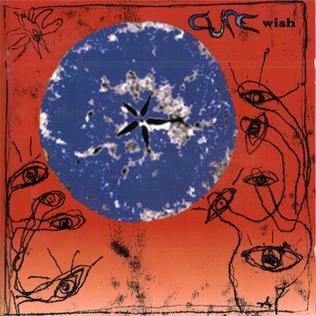 Wish is the ninth studio album by British alternative rock band The Cure, released in 1992. This is the last studio album featuring both Porl Thompson and Boris Williams and the first featuring Perry Bamonte. Special guest Kate Wilkinson plays the viola on the track "To Wish Impossible Things." Although the album was not as well-received by critics as its predecessor, Disintegration, it is the most commercially successful given its debut at number one in the UK and number two in the United States, where it sold 1.2 million copies. The album's second single, "Friday I'm in Love", quickly became one of the band's most popular songs (#6 in the UK, #18 in the US), as it was more light-hearted than most of the band's material and thus appealed to a larger audience. It hit number one on the South African charts. One of the more unusual aspects about The Cure from this era (including Paris and Show) is that the band were simply called "Cure" on cover and promotional artwork. They did not officially change their name however, and "The" returned for their next album. A 2-disc remastered version is intended to be released in 2008. All songs by Bamonte, Gallup, Smith, Thompson and Williams.